Hoping to pack this necklace solid by next week at the latest. 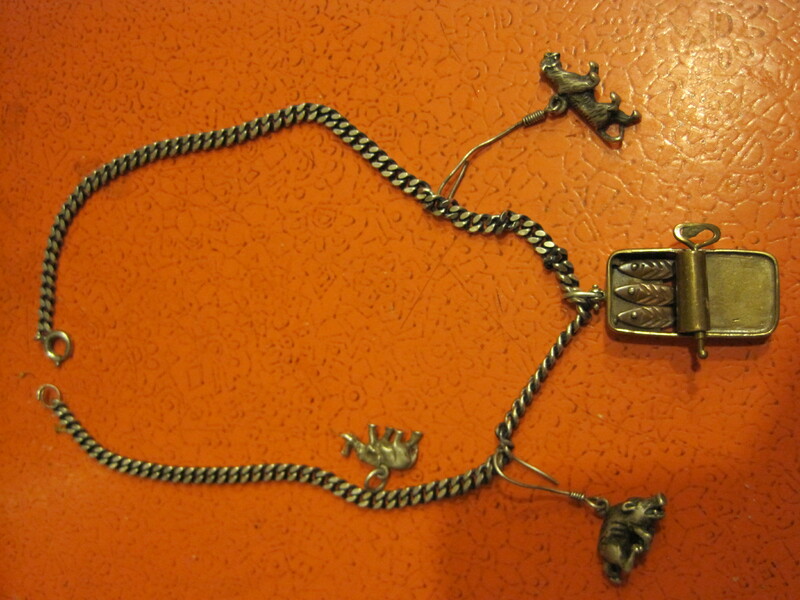 Just got my first charm from the wildly creative Ricky Boscarino, whose Luna Parc charms are without match. As luck would have it, a passing visit to artists Noah and Tia down on Creak Street yielded a trio of cool animals: raging boar (that would be me), wise elephant (guess who?) and a bony tiger (or is it a puma?). Really hope this isn’t way out there…don’t listen, if it is. If it isn’t ….lean in a little closer and tell me the blog is good. ~ by jacquiephelan on January 11, 2010. The tin of sardines is AWESOME. And your blog is a pleasure. One of my regular stops on the Internet. You have to be one extraordinary woman to pull off a sardine tin charm. Amazing stuff.